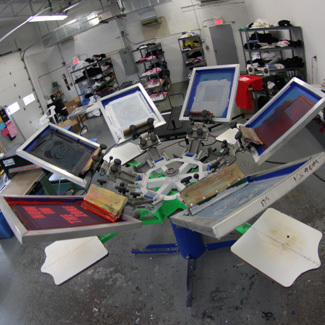 At Universal, we have twenty five years of experience and expertise in screen printing. If you can name it, we've probably printed on it, even waterproof raincoats are no match for our expert printers. From one color to full-color, left breast to sleeves we can do it all. Screen printing and silk screening are different names for the same process. It is a method for putting painted designs on fabric and other surfaces. The image is imposed on a screen and blank areas are coated with an impermeable substance. Inks are forced through the mesh onto the fabric. Each color is on a separate screen and is printed onto the surface one at a time to make up the complete design. Screen printing is a printing technique particularly suited for flat or relatively flat surfaces. The heart of the process involves a fine mesh or screen that is tightly stretched around a rigid frame. The areas that are not to be printed are masked out on the screen. To create the print, the framed screen is positioned over the item to be printed along with a dollop of thick ink. A squeegee is then used to press the ink through the screen. The masked areas prevent ink from passing through, but the unmasked areas allow the ink to be imprinted on the material. The final step is to send the item on a conveyor belt through a heat-tunnel. This curing process ensures that the inks dry quickly so that they materials can be stacked or packaged. Properly cured inks will remain on the printed substrate even under harsh conditions. If more colors are desired in the final design, the process is repeated with different screens. Therefore, a design that requires four different colors would require four different screens. The screens are usually placed on a rotary press which allows the different color prints to be properly aligned or registered with each other. For larger orders, we have fully automatic presses that do not require any manual labor other than set-up and loading/unloading that allow for a significantly higher rate of production.